Aaron Tan vs Steven Lim: Who is telling the truth? In summary, Aaron Tan was reported to have been chased out of his house by his dad after the first news report about him insulting Steven Lim was featured in the newspapers. Aaron recorded the video pleading others not to bully him at the staircase outside his home. Yesterday, a relative of Aaron Tan spoke to Wanbao and alleged that Aaron Tan was paid a few hundred dollars by Steven Lim to make a video insulting him. Steven Lim also allegedly made Aaron Tan sign a non-disclosure-agreement, gagging Aaron Tan from going public about the arrangement. 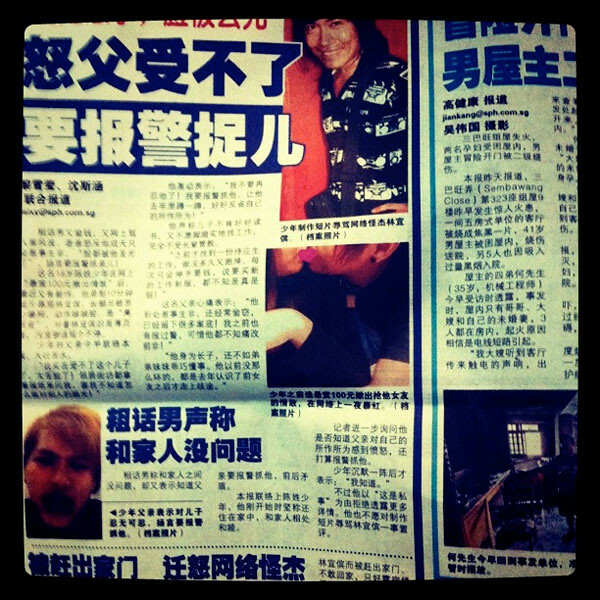 Is Steven Lim the mastermind of all these just to gain publicity for himself? Or is Steven Lim really the victim here, being called “ah gua” by Aaron Tan? Or is Aaron Tan the victim? 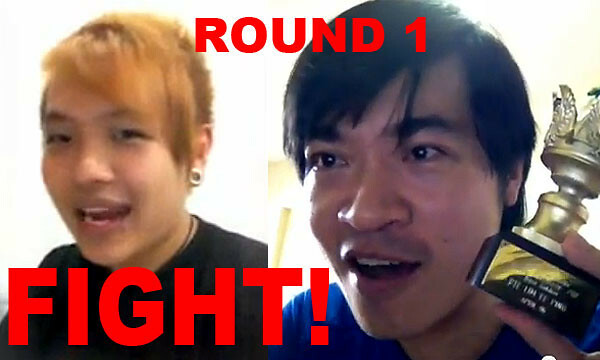 Steven Lim is Jioing Aaron Tan To A Fight! 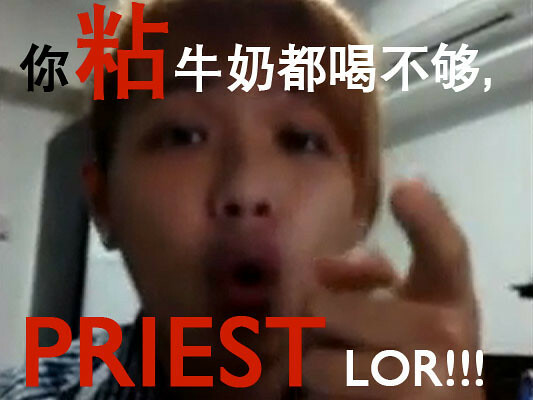 It is likely there won’t be a fight between the two comedians, Steven Lim (yellow undies sushi man) and Aaron Tan (Priest from Bolok Town Secondrary). The latter seems to have chickened out. Frankly, I will be very disappointed and pissed if this online quarrel turns out to be a lame marketing campaign for “BigFish” which keeps getting mentioned in all the videos. Steven Lim is not one to be messed with. Definitely not an “Ah Gua” like Aaron Tan has called him. 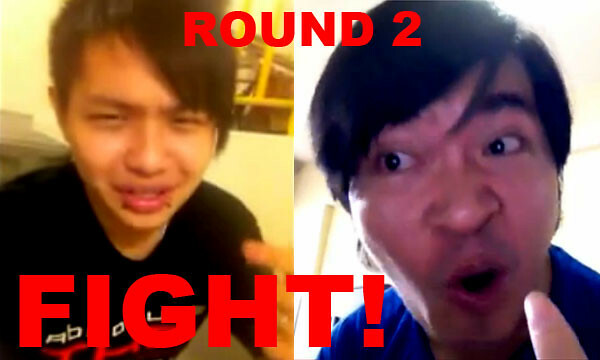 UPDATE (6 Feb 2012): Steven Lim is now jioing Aaron Tan to a Fight. The real story of how Adelyn Hosehbo stole $10,000 worth of jewellery from her mum and got robbed by her “friends”? 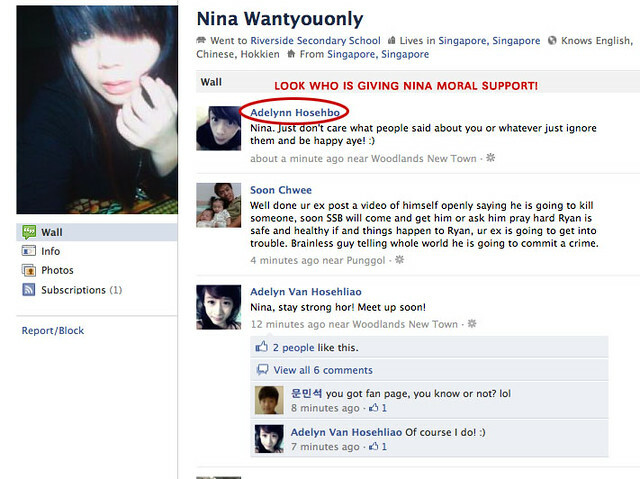 Adelyn Hosehbo getting robbed by her "friends"? She was just a Primary 6 student, but her desire to own branded goods made her steal and sell her mother’s jewellery. And little did she expect that of the $10,000 she received from pawning the valuables, her friends would rob her of $7,000. The girl, 14, had got a friend to pawn the jewellery. She then spent $3,000 to buy, among others, a Gucci bag, a Louis Vuitton wallet and Chanel perfume. But several days later, she met up with two male friends, aged 15 and 17, at a void deck, where she was robbed of $7,000. It recounts the tale of a 14-year-old girl who stole $10,000 worth of jewellery from her mum to buy Gucci, LV and Chanel goodies. After pawning the jewellery for cash, the silly girl ended up getting robbed by her two male friends. The profile and story matches the story of how the infamous Adelyn Hosehbo had allegedly stole from her own mum. 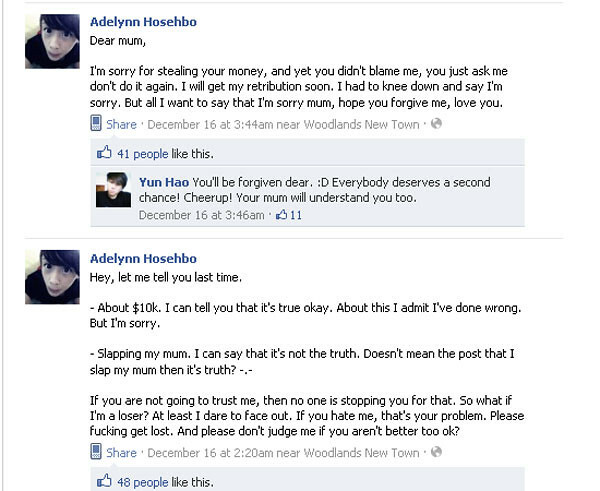 Adelyn Hosehbo: "I did not slap my mum okay (but I did stole from her)! " This girl seriously needs some professional counseling and real friends who would give her proper advices and guidance in life than steal from her when the opportunity arises. Yes, she is bad, but her friends are worse. Anyway want to drink some "Sticky Milk"? It’s finally here! The long awaited TECHNO REMIX of Aaron Tan’s Facebook video rant! The infamous Adelyn Hosehbo and the recently famous Nina Wantyouonly (thanks to her talented video-star/gangster ex-boyfriend, Aaron Tan)… are FRIENDS? Look who is giving Nina moral support on Facebook. Surprised?